Mix first nine ingredients in a medium saucepan, bring to boil. Reduce to simmer stirring frequently for 1 hr and 15 minutes. Place chicken in Crockpot, pour BBQ sauce over chicken, saving at least 1/2 to 2/3 of sauce for later. 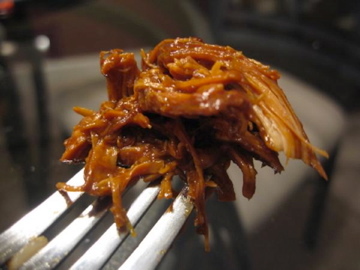 Put Crockpot on low for 6 to 8 hours or high for 4 hours. During the last 15 minutes that the chicken is in the Crockpot, use a fork to shred the chicken. Add a little more BBQ sauce into the chicken and stir. Place shredded chicken on top of potato bun, serve with additional BBQ sauce. Hubby Rating: 10, this is a great summer dinner. It's always a crowd pleaser, very easy to make and tastes delicious!